It's back to brights this week at The Play Date Cafe: red-orange, 'yucky yellow' and juniper are the descriptions given to them by our own Jaclyn Miller. Love the 'yucky yellow' name! At first, I thought I'd have a hard time making a card for this week, but then I saw this product in Reader's Digest and was TOTALLY inspired! I used the lacy medallion from Artistic Etchings by Stampin' Up! and colored it with these markers: Bermuda Bay, Dusty Durango and Crushed Curry. Our Guest Designer this week is Debby Hughes, and wait'll you see her fabulous, clean and simple card made for this challenge! Boy, am I chock-full of news today, literally!!!! Yesterday, I was interviewed by an NBC news reporter in our Philadelphia region (I live in Southern New Jersey, very close to Philly). The reason I was interviewed is for my involvement with Operation Write Home, a non-profit that collects handmade cards from folks like you and me, then sends them overseas to our military men and women. They "shop" for cards for their loved ones, then send them home. The reporter, Doug Shimell, came to my home yesterday and the interview aired last evening. Here is a link to my interview. NBC Reporter Doug Shimell, me and my daughter Haley in my craft area. I've also been interviewed on the same subject by CBS, but they haven't aired their segment yet. When there is a link available, I will post it here! This excitement comes on the heels of another happy event that took place this past Saturday. I drove an hour to meet my friend, Andrea Ewen, then together we drove another half hour or so to meet up with Vicki Dutcher. Vicki was on vacation in Atlantic City, New Jersey with her husband from Phoenix, Arizona - loooong way from home! We had lunch, then shopped at Michael's and a local craft store. We also stopped for Starbucks coffee and took some time to catch up. 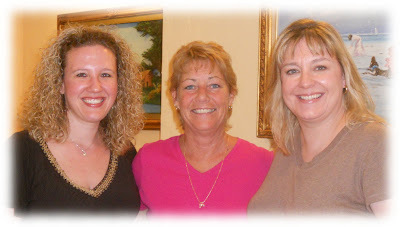 Andrea and I have met up with each other twice before, but this was the first time for meeting Vicki. She is funny, generous and easy to be with. Sunday was busy, too, getting a new bed for our room. We have a small house with a tight staircase. The queen sized box spring wouldn't go up the stairs, so my husband had to get a split box spring. Soooo glad they make that! Then our old full sized one wouldn't go DOWN the stairs (ages ago when we got it, we dinged up the walls terrible getting that sucker up the stairs), so my husband took out the entire bedroom window and dropped it out onto the lawn. What a sight that was! Finally, we have a new comfy bed and it's more spacious. I LOVE it!! My girls helped me pick out the gorgeous bedding. Okay, that's it for now, but I'll be back tomorrow morning with a new card for The Play Date Cafe! Yep, that's the challenge this week at Mark's Finest Papers: Make It Sparkly. My wonderful friend, Carol Hurlock, is the challenge hostess this week. I am so excited with how this turned out! I'm using a stamp from Floating Along, a new set from Mark's Finest Papers. I knew the water in this image would be perfect for a 'sparkly' challenge. I stamped it in Memento Tuxedo Black ink, then colored with Copic markers. A bit of glue and some Crystal Coarse Glitter (Martha Stewart) made the water shimmer. 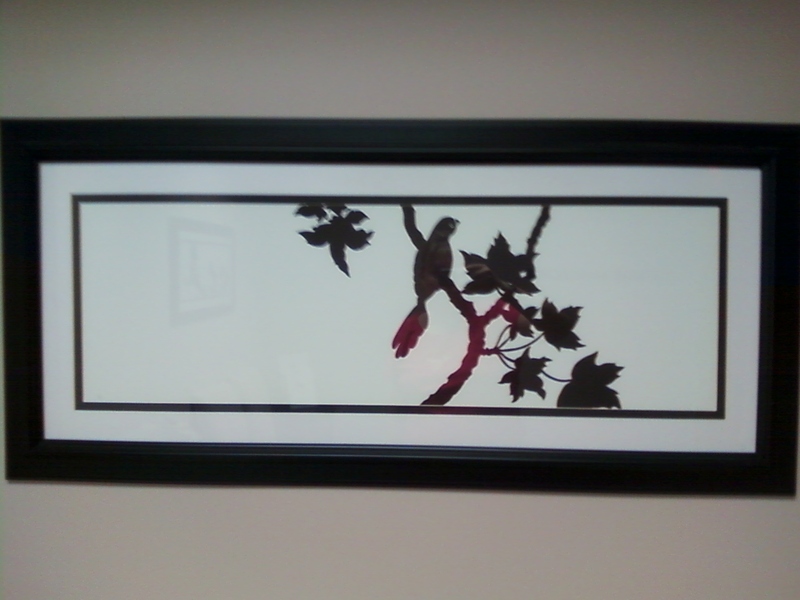 The scene was trimmed and matted on black cardstock. 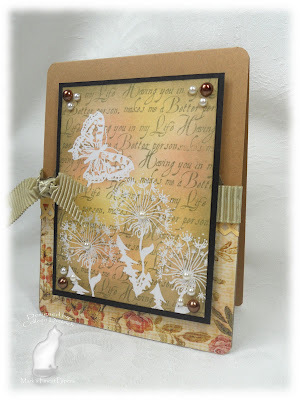 The frame was created with two Spellbinders dies, one nestled inside the other. The blue cardstock was trimmed with the Garden Gate Deep Edge punch by Martha. (loooove Martha's punches) The cotton lace was in a blog candy pack of goodies that I won. Want to play sparkles with us? We'd love to see your creation! Just link up HERE by Friday, July 1, 2011 by 3 PM EST. Guess what I'm doing today, while Blogger puts this post on for me? I'm meeting my friend Andrea Ewen and we are driving to Atlantic City, NJ, to meet the oh-so-talented Vicki Dutcher! She is vacationing at the Jersey Shore, bless her heart. Can't wait to meet you in person, Vicki! 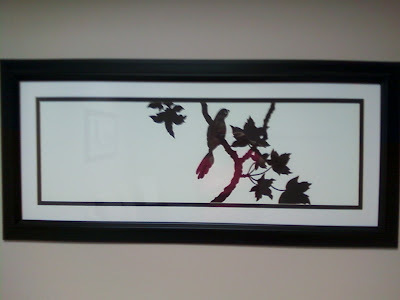 I mimicked the lines of the embossing with my punched black pieces. I love the color story, but didn't seem to have just the right colors. I tried to come close. My Copic marker collection is especially lacking, even though my kids think I have "so many". Due to the color story, my lady has gray hair! I think she looks pretty good in that gray. ;) I didn't pencil in any wrinkles to go with the hair, though. Head over to The Play Date Cafe to see our Guest Designer this week, the multi-talented Stephanie Severin! The topiary is from Flourishes' DIY Topiaries set, and I've had this one colored and in a box for a long while. I just trimmed around it and put it onto the card with dimensionals. This card will go to a friend who has been such a good listener. There've been plenty of times I needed a shoulder to cry on since my daughter became ill this year. I'm happy to report that my daughter has made great strides in getting well. She's not totally out of the woods, but she's worlds better than she was just a few short months ago. Thank you so much for any prayers you've said on her behalf. I'm so very grateful! I tried doing the real "Guy's Guy" kind of thing by making some tires out of buttons. What do you think? The challenge this week at Mark's Finest Papers is to use buttons. I thought about going the feminine route, and getting vintage or shabby chic, but thought, "Nah, let me try something different." The tire tracks are from a set called Big Boy Toys, and the sentiment is as well. I stamped it, then cut it apart, ransom-style. Hope you get a chance to play along, using some buttons! Just link up your card HERE by Friday, June 24, 2011 by 3 PM EST. I made two versions of the same card, as usual. There is a frame included in the Baby Blossoms set. I used it to create a background, but at first I didn't get the hang of lining things up right. This version has things lined up in a well-mannered way. Closeup of center of card. I love each one because they are different. The first card is arranged in a "just so" manner. This one has the frames off-kilter, but has more of a wildflower feel, with different posies arranged in each window. Just Dandy for this one. 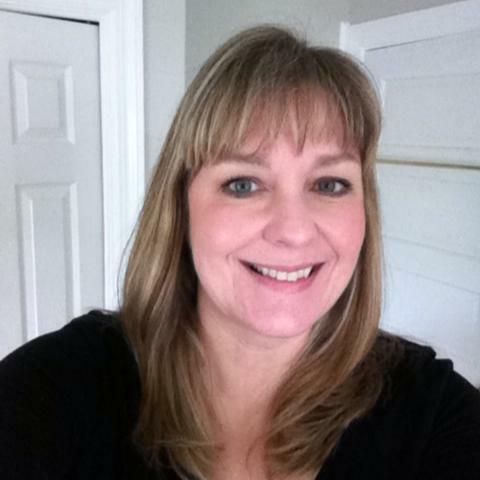 Our special guest this week is Tami Mayberry. Tami is a rock star in this industry. She's all over the place! I had already made a card for my husband, but -- long story -- I have now made a different one. I LOVE how this turned out, and yes, I might get some flak for putting pearls on a guy's card, but it is so worth it! I used the Tim Holtz Damask embossing folder on Sahara Sand cardstock, then rubbed Frayed Burlap Distress Ink and Copper craft ink on the raised areas. After the card was completed, I lightly applied Whisper White craft ink to the edges with my finger. 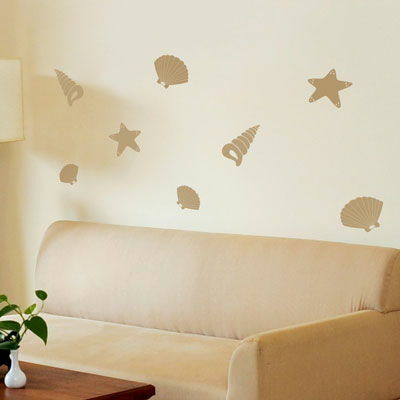 The seashells are from a new Mark's Finest Paper set, Sand Surf Relax. There's a 'daddy' shell, and two 'kid' shells, representing my husband and our kids, since this is a Father's Day card. The pearls just look good with shells, plus they are symbolic of our children being the gems in our lives. The ribbon I have had for, like, 20 years. It was sold at a wreath-making supply place. It looks good with shells, eh? I stamped the shells in Stazon Timber Brown, then used this variety of Distress Inks to color: Walnut Stain, Tea Dye, Pumice Stone, Scattered Straw, and Old Paper. On the large shell, I used my bone folder to give some shape, so it would stand away from the card. I can't tell you how happy it made me to make a card today. In fact, I made another, for an upcoming Play Date Cafe challenge. Heaven! Tomorrow is the last day of school, and then the kids will be home. No more running them to and from school for a while. Aaaah. This is the last week of school, and with it comes a very busy schedule. There are pool parties, art celebrations, spring fairs, and more. I am exhausted from all the running around! I'm also scrambling to find things for my kids to do this summer, like art classes maybe. I did find time to do a BIG birthday card for my now-13 YO daughter. It's 6 3/4" square, so big that I do not own an envelope for it. I just asked her to close her eyes while I placed it in her teenaged-hands. I broke out a piece of Hollywood Vogue Webster's Pages, from my precious supply. I didn't want to cut into it at all, which is why the card is as big as it is! I chose this piece of patterned paper because it has special meaning for my daughter. In the background of the patterned paper is a script from "The Wizard Of Oz." When Haley was really little, that was her favorite movie and she had her very own Ruby Red Slippers from Target. She wore them ALL the time, even when she was in my sister's wedding (we got permission first). ;) When her feet got too big for those "Dorothy" shoes, we had to go get the next size up. Today, on a shelf high on Haley's wall, resides that first pair of Ruby Red Slippers amid her Wizard of Oz figurine collection. I added some lily-of-the-valley stamps from the Stampin' Up! set, Ever After. 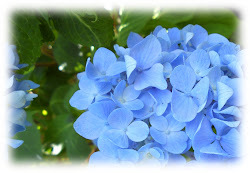 These are Haley's favorite flowers. After stamping them right onto the Webster's Page in Always Artichoke, I used a white gel pen to whiten the flowers. See the Wizard of Oz script in the background? I am proud to have gotten my Deco Fan punch-around-the-page to work so well! This card is entered into one challenge: The Shabby Tea Room - pink, green, neutrals and flowers. I want to share my big news with you: I'm going to be on TV! The Philadelphia-area CBS affiliate is doing a story on Operation Write Home. Operation Write Home (OWH) is a non-profit that collects handmade cards from crafters like you and me, then sends them overseas to our soldiers. The soldiers can 'shop' for any cards they need to send to their loved ones. Recently the president of OWH, Sandy Allnock, asked if I'd be willing to be interviewed for my involvement with OWH (I donated many cards in the past year). I nervously said 'yes'. A producer and cameraman came to my house last week and filmed me! I made cards in front of them, showed off some of my more recent creations, and had an interview. The piece is set to air sometime in July, but the producer isn't sure exactly when. After it does air, however, I'll be able to show a link here at my blog to the CBS site, showing the interview. I can't wait to share that with you! who said: "Congrats again Colleen! 1 year is very exciting. I love how you have showcased your cards over the last year. I don't think I have enough of ones I like to do that. ALL of yours are gorgeous!!! I can't pick a favorite it is too hard! OK I'll try... I love the black, white, & green butterflies as well as the green pink & lilac image! It was a tie! Does that mean we might win our favorites! LOL! Just kidding!" Can't believe it's already Father's Day next weekend! Good thing I was forced to do a Father's Day card for the new Mark's Finest Papers challenge. I do not do the masculine thing well, and always drag my feet on it! I spied this layout somewhere on Splitcoaststampers, and knew I had what I needed to do this challenge. I love this because it is adaptable, with a change of papers, to any occasion, any person. I used papers that came with blog candy I won some time back, so I don't know who makes them. Argyle rectangle, upper left corner: 2 5/8" x 2 1/4"
Green leaves, Mustard herringbone, top right corners: 2 3/5" x 1 1/4"
Bottom widest panel: 4 3/4" x 2 1/8"
NOTE: Each piece was sponged with Frayed Burlap Distress Ink before attaching to card. I hope that helps. This was an easy card to assemble, but the part that took longest was figuring out my sizes. Thanks for such a great turnout last week at Mark's Finest Papers. We had 100 players - woo hoo! Come out and show us your Father's Day card and you might win a stamp set from Mark's Finest Papers. Just link up your creation here by June 17, 2011 - 3 PM, EST. If you are looking for my Anniversary Blog Candy giveaway, click HERE. On Sahara Sand cardstock with the same color ink, I stamped the Linen background from Stampin' Up!. I played with a new-to-me punch from EK Success, Double Embossed Dotted Lace. It's just what I was looking for lately in a punch: big scallops. The flower was made with a SU Sizzix die, Blossom Party, using Sahara Sand and Pink Pirhouette cardstock. The center features a blue and a pink button from my stash, topped with a pearl. This week our Guest Designer is the oh-so-talented Anya Schrier. She has a unique clean and simple style, touched with vintage, that I absolutely love. Hope you join us at The Play Date Cafe this week! More Favorites plus Blog Candy! Hi! Still celebrating my first anniversary of blogging here. This is my last round of "Favorites From The Past Year" for you to see before the Blog Candy Giveaway! It's a way of saying 'thanks' for reading my blog. Okay, here we go! These cards are from February - May 2011. Just click on a picture to go to the original post. For putting up with my endless parade of favorite cards, I have some Blog Candy to offer one lucky commenter. Punched Scallop border punch by Stampin' Up! To be entered into the drawing, just leave me a comment - let's say maybe one of your favorite cards of mine from this past year - before 11:59 PM EST Saturday, June 11, 2010. I'll randomly draw one lucky winner and announce the name on Monday, June 13, 2011. The winner will have 72 hours to contact me via email at bcdietrich@verizon.net with a mailing address.